OSWEGO — SUNY Oswego has named 35 of its faculty as fellows to engage in a yearlong series of intensive training modules called the “Course in Effective Teaching Practices,” with a goal of increasing student success. SUNY Oswego faculty fellow Elizabeth Keida of the School of Education’s health promotion and wellness program takes part in a follow-up discussion recently about teaching techniques she and 34 other faculty members have tried as a result of an intensive, student-success-centered professional development course for instructors. The Association for College and University Educators (ACUE), a company founded in 2014 by leaders in higher education, guides the cross-campus, broadly representative group of faculty in 25 training modules. The program is endorsed by and in collaboration with the major coordinating body for the nation’s colleges and universities, the American Council on Education. Scott Furlong, SUNY Oswego’s provost and vice president of academic affairs, saw demonstrations of the training at conferences, and noted that ACUE’s instructors are themselves faculty at respected schools. “ACUE promoted their program very much around students spending a vast amount of time with professors in the classroom,” Furlong said. “This is professional development for our instructors, to really have them engage with their colleagues around teaching. It is a full-blown program with certification. John Kane, who for years has directed the college’s own professional development arm, the Center for Excellence in Learning and Teaching (CELT), welcomed the ACUE program, which he says “closes the loop” on other skills-building efforts for faculty at SUNY Oswego: To earn each of 25 badges and ultimately achieve certification, the fellows need to implement in their classrooms at least one of the evidence-based teaching practices — there are more than 200 in all — per weekly training module. They also must reflect deeply outside of class and discuss their experiences with the faculty learning community. An outside grader reviews and scores their work. For example, a set of techniques known as “advanced questioning” features video of accomplished educators prompting students with pre-planned questions that help students make connections to other things in their lives. Professors from Kansas State University, the University of Connecticut and Florida A&M University appear in videos demonstrating the techniques, which are designed to improve students’ own critical thinking and questioning. ACUE says over 30 years’ worth of research in cognition and adult learning has proven that effective teaching improves learning for all students. Kane agrees. 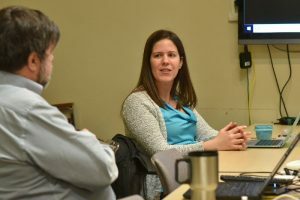 Teaching fellows Elizabeth Dunne Schmitt of economics, Eric Hellquist of biological sciences and Elizabeth Keida of the School of Education’s health promotion and wellness program attended a recent training follow-up discussion in CELT’s office in Penfield Library. Other fellows — including Mamta Saxena of human development, Mark Springston of technology and Michael Quirk of intercollegiate athletics — attended remotely via Zoom video conferencing. Kane, an economics professor, coordinated the session. Schmitt said that following an early ACUE class, she surveyed a large class of students with the question, “What’s the best — and worst — class you ever had, and why?” Results supported the ACUE model. Students want to be engaged and active in class, she said, and not merely take notes as a professor reads from Powerpoint slides. Keida said she has looked for opportunities to learn more about pedagogy — methods and practices in teaching — in her seven years here, and is delighted to have been chosen a fellow for the “Effective Teaching Practices” certificate program. The teaching fellows will work through the ACUE program all through the spring and fall semesters. Those who earn their ACUE Certificate in Effective College Instruction will attend a pinning ceremony early in 2020, CELT’s Mushtare said. Through ACUE’s Community of Professional Practice, certificate holders receive “ongoing support to refine their teaching, stay current on research and advance the national conversation,” the company says.